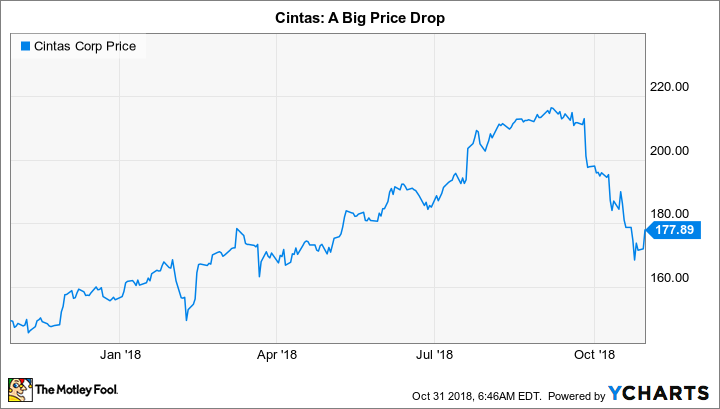 Normally you would expect a big price drop to lead to a buying opportunity, but it just isn't time to jump at Cintas yet. Cintas Corporation (NASDAQ:CTAS) is an incredible growth story. And with the stock down over 15% from its recent highs, it's worth a close look today. But once you do that, you'll see that the uniform expert is still rather expensive by historical standards. Here's why even a double-digit price drop isn't enough to make this growth stock a good deal. The first thing you need to understand when looking at a company like Cintas is that even great companies can be bad investments. That's one of the central teachings of Benjamin Graham, the man who helped train Warren Buffett and who is generally considered the father of fundamental analysis. To paraphrase these master investors, price is what you pay and value is what you get. Overpay and you can lose money even if a company is executing well. That, indeed, is the risk today with Cintas, despite a huge drop in the stock price. The company completed fiscal 2018 in style, with revenue up a massive 21% year over year, driven by an acquisition. Organic revenue growth was an impressive 7%. Earnings, meanwhile, were up nearly 70%, helped along by tax law changes and lower merger-related expenses. The company followed that up with another strong showing in the fiscal first quarter, with revenue and earnings up 5% and 30%, respectively. Cintas has clearly been doing pretty well lately, with its core business benefiting from a growing economy and its bottom line helped along by the current administration's tax law shifts. In fact, the company made sure to point out that it has grown revenue and net income in 47 of the past 49 years when it reported fiscal 2018 earnings. (The deep 2008 to 2009 recession was the only time when it didn't grow these two metrics.) Essentially, it's been doing pretty well for a very long time. Management, meanwhile, is increasingly positive about the future, too. When it reported fiscal first-quarter earnings, it also increased its full-year earnings guidance range to $7.19 to $7.29 per share, up from the range of $7.00 to $7.15 announced just three months earlier. There really is a lot to like about Cintas' business when you look at its financial results. But as Graham would warn, a good business isn't always a good investment. To put it simply, Wall Street is well aware of Cintas' success and has put a premium price on the stock. Such a high premium, in fact, that the recent double-digit pullback isn't enough to bring its valuations back to historical levels. For example, its price-to-cash-flow ratio is currently around 22.5 compared to a five-year average of just under 19. Its price-to-book-value ratio is around 5.7 compared to a longer-term average of 5.2. And its price-to-sales ratio is nearly 3 compared to an average of 2.4. On every one of these valuation measures, Cintas looks expensive today. That said, the company's current price-to-earnings ratio of 23.8 is below the five-year average of just under 26.5. While that looks good on the surface, you need to take the number with a grain of salt. Recall the tax-law change benefits mentioned numerous times in the discussion above. In fiscal 2018 alone the tax reductions added a massive $1.59 per share to earnings. That boost skews this metric, suggesting that you should pay more attention to the valuation numbers cited in the previous paragraph -- all of which suggest that Cintas is expensive today. Cintas is a great company and investors know it. That's why it's priced at a premium today, a fact that remains true even after a big stock price decline. This is a company that you may want to have on your wish list, but it isn't one to chase today if you're looking for a bargain.